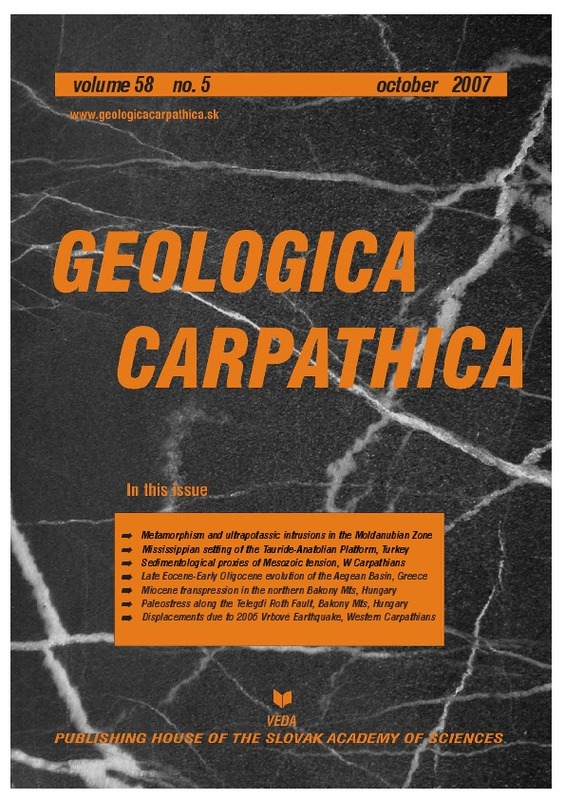 Abstract: The authors performed geological mapping and microtectonic measurements around the Csesznek Zone in the northern Bakony Mts, Transdanubian Range, Hungary. As a result of structural observations a new structural-geological map was created for this area. Four tectonic phases were separated by the analysis of stress field. The oldest tectonic event detected in the research area was defined by a WNW–ESE compression and we attribute a Middle Eocene to the earliest Miocene (50–18 Ma) timing to this phase. On the basis of structural measurements and regional considerations we can tentatively separate two deformational events in the late Early to Middle Miocene (18–11 Ma) time span. The older “syn-rift phase” (18–14.5 Ma) is characterized by NE–SW tension and the younger phase is marked by NNW–SSE compression and perpendicular tension. This strike-slip-type stress field with transpressional character formed or reactivated the main dextral faults and associated overturned en echelon folds and thrusts in the Csesznek Zone. The latest, Late Miocene to Pliocene(?) extensional deformational phase (11–3? Ma) segmented the range with normal faults. The newly recognized transpressional character of the Csesznek Zone indicates that a short syn-rift event of the western Pannonian Basin was followed by widespread transpression, as it was also described in other parts of the Transdanubian Range. This transpression can be connected to basin inversion in the easternmost Alps, and important contractional deformation in the eastern Southern Alps, and northernmost Dinarides. The intensity of this transpression was declining to the NE, where the extensional deformation prevailed and was influenced by the subduction still going on along the Eastern Carpathian thrust front.